I meant to post this a few days ago, but I'm been so sick I haven't had the chance. 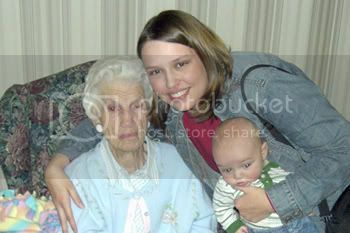 I was feeling better Tuesday, which was my great-grandma's 100th birthday. She's still just a spunky and caring as I've always remembered her. In the past few years, she's slowed down a little, but not too much. She still lives at home, still makes fudge and practices her exercises on her walker. I really think she is too stubborn to die. She has 19 great-great-grandchildren. How amazing is that!?! Anyway, we went up to her party on Tuesday, and the she filled a whole stake-center cultural hall. Everyone loves her, because she is genuinely interested in you and completely unjudgemental. I've never heard her say an unkind word about anyone. The party was fun, although it would have been more fun if Jay and Melissa and Mom and Dad were there with us, but unfortunately, they couldn't get there until later. Here's my great-grandma, sitting like a queen in her chair, greeting all her guests.